Trees literally hold our island state together. They help define Hawai‘i’s sense of place, that special connection between our diverse cultures and the environment, the land and its people. While trees in urban areas may appear to have a different function than trees in the natural forest, they often are the first connection that communities have to nature. 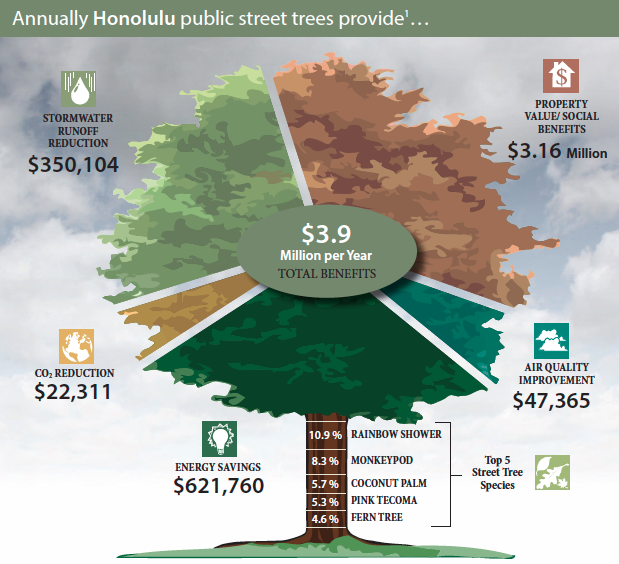 Each year 100 large, mature street trees help create healthier communities by removing 19 tons of carbon dioxide and 372 pounds of other air pollutants. Tree-lined commercial districts are better for business. People report more frequent and longer shopping and spend up to 12 percent more for goods when they shop in attractive settings. Tree-filled neighborhoods are safer, reduce mental and physical stress, and encourage people to spend more time outdoors. A healthy urban forest reduces erosion and filters pollutants significantly reducing runoff and the destruction of our valuable reefs. Trees cost-effectively filter and improve water quality by reducing stormwater runoff and flooding. 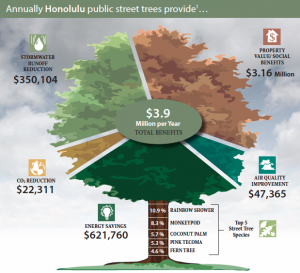 Trees in Honolulu intercept more than 35 mil. gallons of stormwater per year. This contribution is valued at more than $350,000 annually. More Details and Citations Can Be Found Here.